You’ve discovered the rejuvenating power of yoga, now it is time to expand and create wholeness in all areas of your life. What would your life be like with an abundance of energy and vitality? Stop dwelling on restrictions, and “why you can’t” and discover the simple nutrition & lifestyle choices and that will empower you to reach your peak vitality. Explore how all areas of your life are connected and how by adding in more energetic fuel you can begin to truly live your most vibrant life. 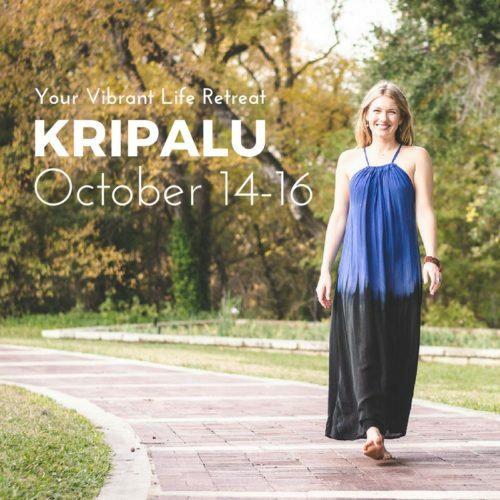 With Kripalu’s campus & kitchen as our resource, you will learn daily practices through the 7 pathways of food, movement, thoughts, play, love, rest and connection. The tools you will take with you at the end of our time together will be your guide and will support you in making gradual, sustainable lifelong change. Say yes and start living your vibrant life!